Storage solutions come in so many designs and forms. MĀJA hanger shelf is a lovely hybrid between two everyday objects used everyday. Yet it is convenient for storing smaller things that can clutter the space. Accessories, jewellery, and all those other little things that are challenging to store can be easily kept inside the wardrobe on MĀJA Hanger Shelf. 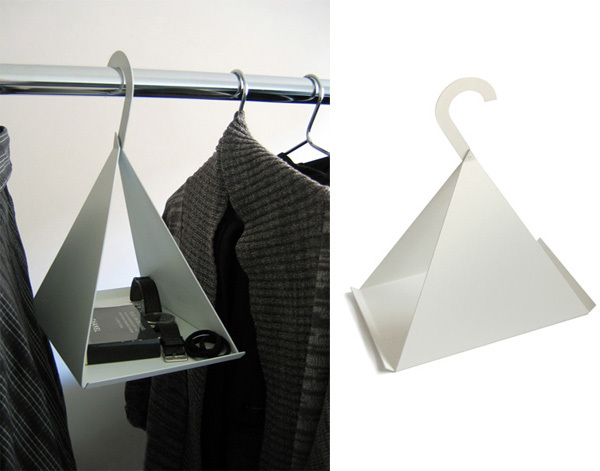 Designed by MĀJO this convenient hanger shelf is a great solution of storing accessories right inside of the wardrobe together with the clothes. Due to its specific design MĀJA shelf can hang on the rod and provide surface for storage. MĀJA hanger shelf comes in black and white as well as salad green and will not only be useful but also look interesting in the modern style decor. It doesn’t have to be hidden away inside the wardrobe and can be used to store many other little thing scattered around the house.